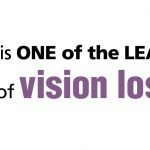 Poll finds losing eyesight as potentially having greatest impact on day-to-day life–more than other conditions including loss of limb, memory, hearing, and speech (57% of African Americans polled, 49% of non-Hispanic whites, 43% of Asians, and 38% of Hispanics). When asked what disease or ailment is the worst that could happen to them, blindness ranked first among African Americans, followed by AIDS/HIV. Hispanics and Asians ranked cancer first and blindness second. Alzheimer’s disease ranked first among non-Hispanic whites, followed by blindness.